The beauty of Smoky Mts is just a part of what makes our area special. Enjoy the many activities - fishing, rafting, horse riding, hiking, biking, Dollywood, or a beautiful drive through the Great Smoky Mts. Enjoy! We stayed here in late October and early November. We had a Creekside site. Some sites are fairly close but others have a bit more room. Creek was nice. Sites have concrete pads and very level. Laundry was clean. Lots of Elderbox bugs this time of year. All looking to find a warm place to spend the winter. Especially in and around campers. Took about three weeks to get rid of all them. Even traveling they find a way to hang on. Park is secluded yet right in the middle of Pigeon Forge. Very easy to get around. Definitely a great place to stay. Already booked again for April. Currently on day 4 of 6 and I could not be happier here. The pictures don't do it true justice. Its better then they look. Sites are very well maintained, grass is well manicured. My dog loves it so much that she rolls in the grass every chance she gets. The pool isn't all that deep but their sister property just across the street has 3 pools, 2 hot tubs, and a lazy river that we have access too free as well more then makes up for it. The restrooms are very well maintained and cleaned. The roads are all paved and all site are concrete. My only complaint is that there is no play ground for my kids but the activities of Pigeon Forge and Gatlinburg kept us most entertained. Will come and visit again! Rating says it all about this place! The staff are friendly and helpful, the restrooms are wonderful [the only thing I could offer for improvement is air circulation]. During a particularly brutal heat wave it's a bit uncomfortable in the showers due to no fans or air circulation of any kind. Otherwise, the laundry, grounds & utilities all worked perfectly. We don't have children, but for those of you that do, the splash pool is pretty large and seems well maintained. Campers can also use the two pools across the street at Mainstay by showing their paid invoice from Pine Mountain. 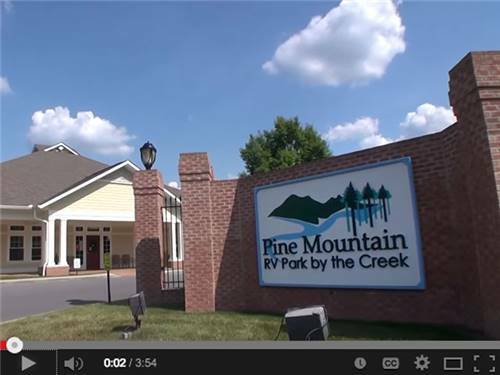 Pine Mountain RV Park sets the standard for what an RV park should be. It is clean, well layed out, plenty of space between sites, and has excellent RV utility hookups. Every site has a well designed concrete pad that include an ample patio. Anybody designing, building or renovating an RV park should visit this place too see how it should be done right. Great park! We spent six days at the park and really enjoyed our time. The sites are level with concrete pads, all the hook-ups were easy to use. The staff was very friendly and helpful, even offering information on best places to eat. The wifi was faster than most parks. We would highly recommend staying here. This was our 1st trip to the area, so we really did not know where to stay. We picked this park based on what others had said and also because it had cement pads. We stayed at one of the back in sites near the creek, it was easy access and had no issues with the hook ups. The park isn't big but we like that, it was nicely landscaped and just enough off the beaten path that it is quiet but also it was quite easy to access all the sites in Pigeon Forge. We did not have a car right away so we took the Trolley and found it convenient and efficient. We enjoyed our stay, the staff was friendly and helpful. We will visit this park again. Everything about this park was excellent with the exception of the limited items that they had in the gift shop, a larger selection would have been welcomed. I can't say enough good things about this facility. We arrived very late at night but still had a lovely stay. The site was very well maintained, quiet and clean. The bathrooms are new and had plenty of hot water when we showered. It was conveniently located 2 miles from Dollywood which was our destination. Staff was very friendly. Second time staying here. Very clean park. Level concrete sites. Full hook up, sewer, 30 and 50 amp, water (pressure was a little low but working on it at one site) 25 cable stations and fire pit. Wifi was good. Had a site next to creek. Had about 5 inches of rain so the creek level came up a great deal. Some sites did hold water around the electrical pedestal. Ducks walk around and come close to camper. About half mile off 441. On trolley stop. Quite and peaceful. One of our favorite campgrounds. Small store, washer and dryers and pool. Tables and chairs to sit around pool. Will stay here again. Excellent park! We will be back! This park has many positives and I have been returning here for five years. I usually camp here for 2 weeks in the summer and 1 week in the fall. The park has always been very clean and although it is in the middle of Pigeon Forge it doesn't feel like it is in a city. It is a kid friendly park and my grand kids love the pool here. Some sites are a little small for my camper but they work hard to give you the size site you need. The facilities are excellent but it would be nice if they could add a couple of machines to the laundry room. The only reason I did not give the park a perfect rating is its uneven enforcement of its' own rules. An example is the no parking on the grass. Sometimes if you let even one tire on the grass they will ask you to move which is OK because that is their rule but I saw them allow a jeep to park completely on the grass for over a week. Long enough that the grass was dying under it. I don't mean to sound negative because I actually look forward to coming to this park and hope to be able to return for many years to come. Just please enforce your own rules evenly. Fall reservations already made. This is one of the nicest parks we’ve ever stayed in. We stayed for 5 days. Everything was nice and new looking and the grounds were very well manicured. Our site was a pull through that was concrete, level and plenty long enough for our pull vehicle to stay connected to our travel trailer. All together our rig is about 46’ long. The site was also plenty wide for our awning on one side and the slide out on the other. Our slide out extends about 44”. Cable, water, sewer, electricity all worked as you would expect. We didn’t get on the wifi much but I think it worked adequately when we did. There are 2 trolley stops right across the street. We went everywhere on the trolleys. The only time I unhooked and used our vehicle was when I wanted to do some grocery shopping at Publix. When you get on the trolley from this RV park, you have to go through or near a lot of the other RV parks in Pigeon Forge and in my opinion Pine Mountain is the best one after seeing the others. Some of the others aren’t bad, just not as good (appearance wise anyway) as Pine Mountain. The downside is you have to take this tour every time you get on the trolley. The good news is you’re the first stop when returning at the end of the day when you’re tired. 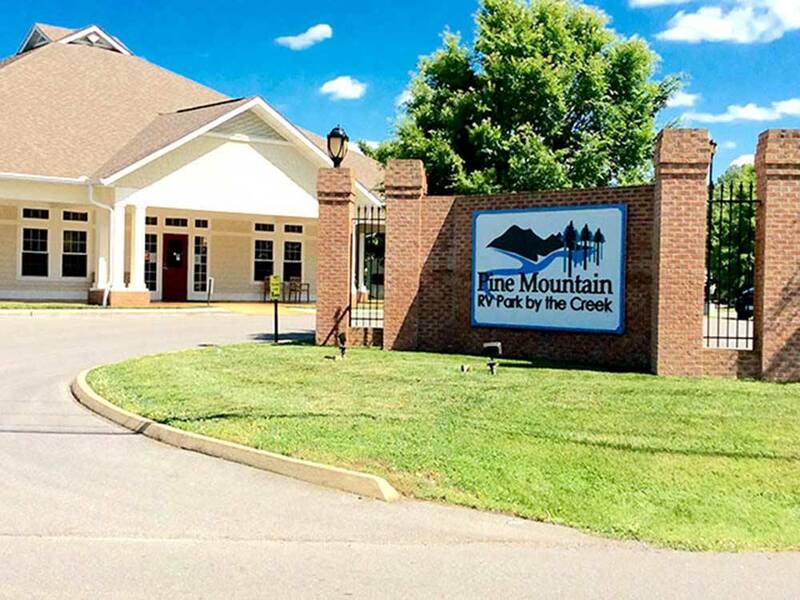 Pine Mountain is a little over a mile from the main road of Pigeon Forge where all the activities and restaurants are so none of the restaurants or activities are within walking distance and other RV parks are closer to the main strip, but depending on your perspective this is a pro or a con. We liked being away from the action when we wanted to be. We didn’t use the park showers cause we used our own but peeked in and saw they are very nice. Every employee we came across was friendly and helpful. Only noise issue we had was one of the trailers behind us decided to turn on their generator a few times early one morning right before they left. I don’t know if anyone told him he wasn’t supposed to run it or not but he didn’t run it very long. Or at least it didn’t seem to be on very long. The pool was very nice and the kids enjoyed it. I believe you are also allowed to use the hotel’s pools across the street but we didn’t take advantage of that. The park pool was plenty good enough. There were also a few ducks around and the kids enjoyed following them around and trying to feed them. There is a little store in the office for necessities but not much else. Don’t expect to do any real grocery shopping there. We picked up some toilet paper and a few soft drinks. As an added bonus, even being away from the main part of Pigeon Forge, we were able to see the fireworks at Dollywood from the RV park. Not only would I stay here again if in the Pigeon Forge area, I think this is the only RV park I’d stay in if available. Great campground. Very clean, staff was very nice. Bathrooms are clean and beautiful. WOULD HAVE GIVEN PERFECT RATING BUT THEY LACK IN ENFORCING RULES. THIS RV PARK IS BEAUTIFUL AND PET FRIENDLY BUT A LOT OF CAMPERS DON'T CLEAN UP AFTER PETS WHICH MAKE IT TERRIBLE FOR THOSE WHO DO, PINE MOUNTAIN IS RIGHT IN THE MIDDLE OF ALL PIGEON FORGE HAS TO OFFER WHICH IS PERFECT.